Actually, it was from the Mississauga Media page, and the info was IMPORTANT, that’s why I said “important info” so stop always accusing me for doing things. Admins, are already taking care of it.if you keep on Reporting things to the Admins you will be held accounted for. Pics at Central! And some important info: 312 - Average kms each bus clocks on a week day 71,300- Average km’s each bus clocks yearly 37 – Amount of km the route 109 does daily, the longest MiWay route 1,201,994 – Kms bus # 0304 has the odometer; the highest on the fleet as of March 16th, 2018 7 – Amount of kms the route 37 does daily, the shortest MiWay 305/70R/22.5 – The tire size of all buses 50,000L – The amount of diesel delivered daily to the Central Parkway location, or 18,250,000L yearly 1,300,000L – The amount of diesel delivered yearly to the Malton location 34 – Number of seats on the new Nova buses 8 – Number of wheels on a 60 foot articulated Nova bus 80 – The average number of passengers that safely fit on a new Nova bus (sitting & standing) 500 – Number of buses in total on the MiWay fleet by Dec 31, 2018 (15 hybrid, 335 40-ft orange, 83 40-ft blue. 45 60-ft orange, 22 60-ft blue) Source: Mississauga Media. These incidents are pretty Common, the same thing happened to 1056 on the 110 a couple weeks ago. 2005 MiWay 0547 is here Making a stop at Erin Mills Town Centre while on route 48. 1812 entered service today while on route 42. I rode 1802 yesterday and The lights were completely off and There were Halloween decorations on it. the fleet now Programs "LEST WE FORGET. Your Photos inspire me a lot! Thanks! Kevlo, keep up the good work! 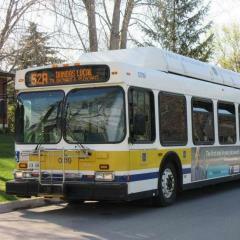 Retired MiWay 0879 has been spotted off Derry Rd one street north! Credits to @TTC T6H-5307N 2252 for the Picture. It was also taken at City View bus sales in Mississauga! What's your favourite Thomas the Tank Engine story? That Unit has a Voith D864.5 Along with the 1201-1215 Units.